It had to happen sooner or later. At a time when the video store is practically extinct, the much loved Video Gallery, on Park Slope's Seventh Avenue, will be gone by the end of the month. Last time I returned a DVD there, a couple of weeks ago, the owner, Kathy Smelyansky, waived my late fee, and I guessed the end was in sight. For those under a certain age, selecting your viewing pleasure online is second nature, but I still liked walking to an actual store and browsing. I liked talking to someone like Kathy, whose opinion you could ask about any kind of film you cared to mention, and who would always respond with a personal & knowledgeable review. Just how many thousands upon thousands of movies had this wonderful woman watched over the years? She seemed to know them all. I liked the randomness of finding a film you didn't anticipate, of film conversations with Kathy or other customers, of personal encounters rather than virtual selection. Places like this, just like bookstores, or libraries, allow you these opportunities. The real world matters. Of course, we're lucky to live in a city where the best way to see a movie - up on the fairly big screen - is so easily available and the choice so broad, even at such high prices. But the video store phenomenon - thirty five years or so from start to (almost) finish - was something special too.. When you go into the store right now, the atmosphere is one of shocked sadness, and appreciation. We can't believe the place is really closing! There's a sale on in the store & the DVDs are disappearing fast. Let's face it, there are films here you'll never find on Netflix. But as much for their own collections, people are buying keepsakes of a place and an era. 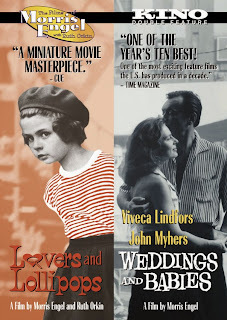 I bought two films by Morris Engel & Ruth Orkin, Lovers & Lollipops, & Weddings & Babies. Like the better known Little Fugitive, both black and white films were shot in New York, and take you to earlier days in the city, to the streets of 50s Chinatown, and a Feast of San Genarro in an altogether different Little Italy. Kathy will be off traveling soon, and has plans for a very different line of work. Many, many thanks for the movie home you built for your loyal customers. We will miss you.